Here is an article on contour maps that are used for estimating the risk of recurrence after surgery. 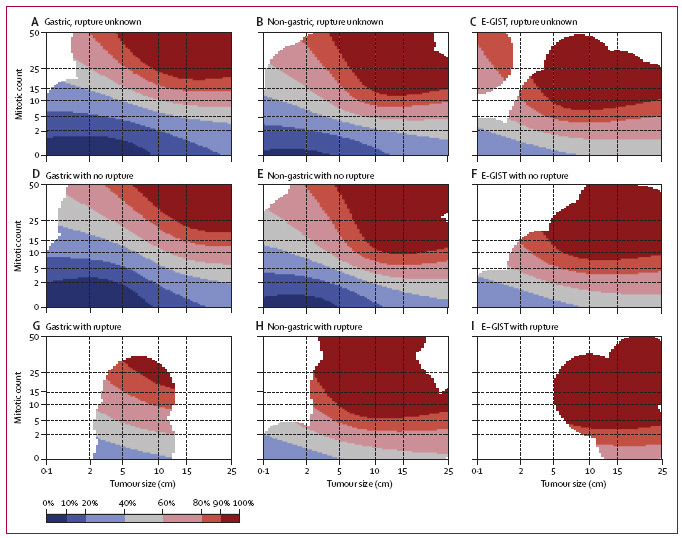 The upper row maps are used when tumour rupture status is unknown (A,B,C), the middle row maps when the tumour has not ruptured (D,E,F), and the bottom row maps when tumour rupture has occurred (G,H,I). Red areas depict high risk, blue areas low risk, and white areas indicate lack of data. The percentages associated with each colour (key) indicate the probability of GIST recurrence within the first 10 years of follow-up after surgery. For example, the middle map of the far left column (D) shows that the 10-year risk of GIST recurrence of a patient diagnosed with a 10 cm gastric GIST with five mitoses per 50 high power fields (HPFs) of the microscope and no rupture is 20–40%. The 10-year risk associated with a similar tumour when the mitosis count is ten per 50 HPFs increases to 40–60%. E-GIST=extragastrointestinal stromal tumour (arising outside the gastrointestinal tract). Note: These contour maps estimate the risk of recurrence for patients not taking Gleevec.